She may not be a supermodel walking the runway like sister Kendall Jenner, but Kim K sure knows a thing or two about stealing the show. At the Givenchy Paris Spring 2016 New York Fashion Week Show, Kim Kardashian showed her pregnant belly in a stunning sheer lace gown that put her baby-to-be in the spotlight. I don't know if it was the bronzer and the contouring or that so-called "pregnancy glow," but whatever it was, it was working for Kim Kardashian on Friday night. The expectant mother looked like a total goddess in her Givenchy gown, one that came straight from the Spring 2016 collection. Although I already saw the gorgeous black dress during the show on the model, it's like I saw it again for the first time on Kim K — it seems like Riccardo Tisci made it especially for her. Even if he didn't, I'm betting that it was, at the very least, tailored to her liking. The gown was completely sheer from the belly down, featuring intricate lace detailing all the way to the bottom of the dress. 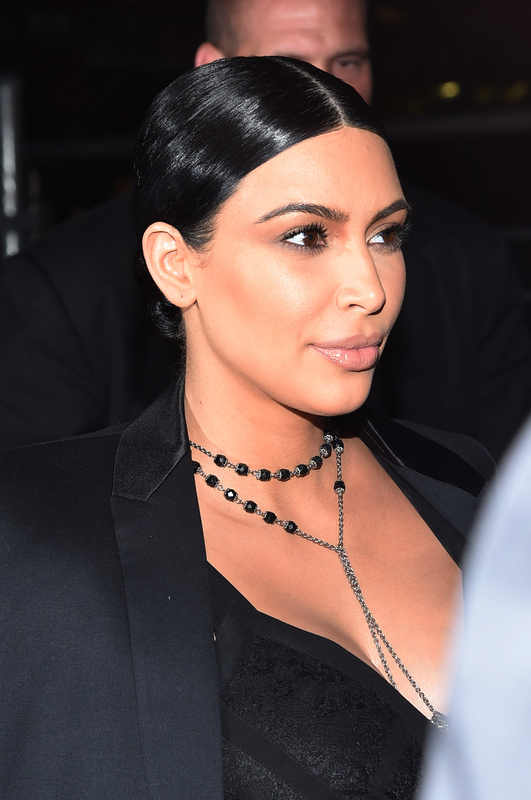 Kim wore a black blazer over her shoulders and completed the look with a rosary-inspired necklace. She pulled her hair into a slicked back, middle-parted chignon and kept her makeup minimal. The entire look was very gothic-meets-bohemian, but in a very high-fashion sort of way — a way that only Kim K could pull off. Of course, hubby Kanye West was also in attendance and complemented his wife perfectly in a matching black ensemble consisting of leather pants, a long gray tee, a black bomber jacket, and fresh black kicks. I don't know any other pregnant celebrity who has the chutzpah to rock this look out in public, but I'm so glad she did. The show in it of itself was amazing, but years from now, people will probably only remember this outfit that she wore. Hate it or love it, y'all — I think Kim looks beautiful!